ICH Blog: Reddin' lines and ochre boxes - how many of you have one of these in your shed? Reddin' lines and ochre boxes - how many of you have one of these in your shed? They’d have the reddin’ lines, the used to call it. They used to strike the [log] with a marking line, with red ochre on it. That would leave the mark on the log where he wanted to come along and saw (Story et al. 408). A red’ning box, you know, but some people call it a ochre box. This is a old red’ning line I was telling about lining the sticks. You use ochre in there and a drop of water (Story et al. 408). Carpenters today are familiar with the more modern chalk lines that work in a very similar way. 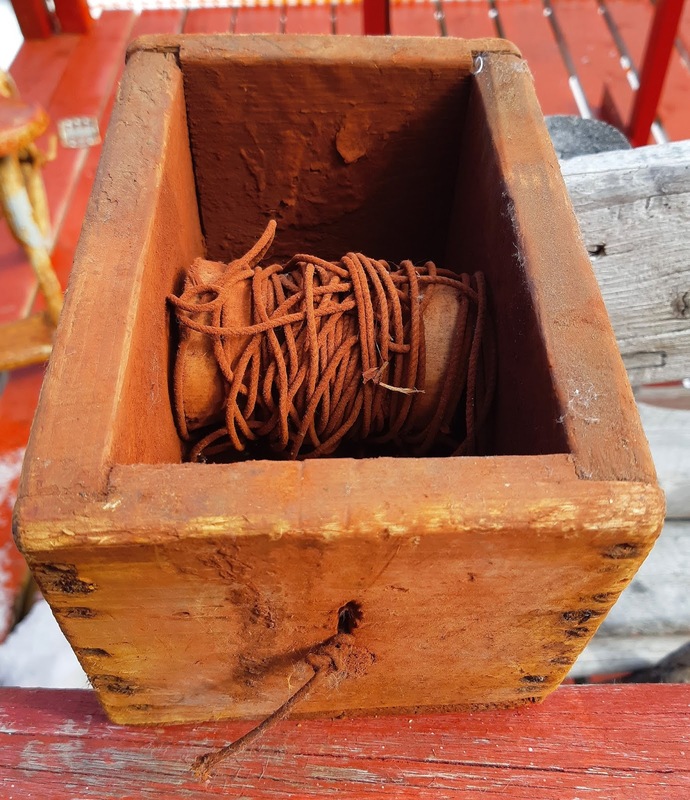 The handmade example in the photo above comes from the collection of Mr David Boyd, Twillingate, who runs the Prime Berth Fishing Heritage Centre (http://www.primeberth.com). If you drop by this summer, I'm sure he'll show it to you! Story, George, et al. Dictionary of Newfoundland English. Second Edition. Toronto: U of Toronto P, 1990.